LG 42SL8000 review | What Hi-Fi? 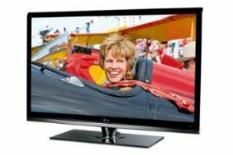 Before we get to the nuts and bolts of what's a rather good TV, we're going to grind the same axe as we did of the LG 42SL9000: hiding the front of a framed TV behind a sheet of glass or plastic doesn't magically make it ‘frameless'. Turn the LG 42SL8000 on and the frame is perfectly obvious. Semantic catastrophe aside, this supposedly ‘frameless' LG is a slim, clean-looking screen with a long spec sheet: four HDMI inputs and a 200Hz ‘TruMotion' motion processing engine are the highlights. Like all new LGs, the 'SL8000 is packing the most user-friendly on-screen menus around, and the remote is happily glossy. The LG delivers punchy, high-contrast images from all sources, and draws edges with confidence. Moon on Blu-ray enjoys deep black tones, good detail levels and a vibrant colour palette. The LG's also a decent upscaler of DVDs, giving an organisation to images that lesser TVs don't provide. The TV tuner has the same assured edges and hard-hitting contrasts that other sources enjoy, while sound is on the right side of abrasive. It's with motion that the LG loses composure. The ‘TruMotion' processing has three settings, but at no position is motion-handling entirely satisfactory – there's either a reluctance to pan smoothly or some ghosting of fast-moving images. It's not as pronounced as with some TVs, but it's enough to kibosh any chance of a fifth star.